The Swiss Museum of Stained Glass (Vitromusée) is housed in Romont Castle. The Museum has a marvellous collection of stained glass and reverse painting on glass plus temporary exhibitions. 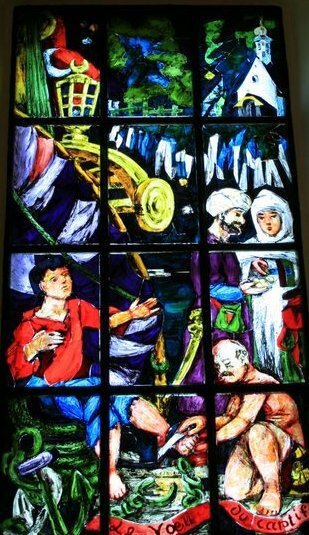 The fascinating history of the development of stained glass is presented in a permanent exhibition of key works. The visitor follows a path leading past archaeological fragments from the 5th century AD, via masterpieces of the Middle Ages, the Renaissance, Historicism and Art Nouveau right up to the most recent modern glass art … Although the names of the artists who designed the oldest pieces of stained glass are generally not known, later works often bear the hallmark of well-known workshops or artists: among them, to name but a few, the workshops of Dirk Vellert (16thC), of Gustav van Treeck (19thC), or of Louis Comfort Tiffany; or the artists Alexandre Cingria, Léon Zack, Alfred Manessier, Yoki, Augusto Giacometti or Brian Clarke’ (www.vitromusee.ch/en/vitromusee/discover/the-castle.html). Of particular relevance to my sabbatical art pilgrimage was a piece by Konrad Vetter entitled 'Canticle of the Sun' inspired by the Song of Praise of St Francis of Assisi and, through his reduction of leaded glass to its most essential, a pure hymn to light. A stained glass fragment by Marc Chagall has recently been purchased and is on display together with a film discussing his stained glass work with Charles Marq. ‘While he was finalising the stained glass for Mainz Cathedral, Marc Chagall gave a small stained-glass panel to the master glazier at the Simon Marq atelier in Reims with whom he had worked for many years. This glass bouquet by Chagall is one of the rare stained-glass panels by the artist that was not designed as part of a building.’ It occupies the central place in a special exhibition of the latest important acquisitions by the Museum (http://www.vitromusee.ch/en/vitromusee/exhibitions/chagalls-bouquet.html). The Groupe de St Luc et St Maurice became based in Romont when its leader Alexandre Cingria settled there in 1937. This group was founded in 1919 and brought together artists, architects and intellectuals (including François Baud, Fernand Dumas, Marcel Feuillat, Adolphe Guyonnet, Marcel Poncet and Georges De Traz, among others) whose aim was to breathe new life into church art in French-Switzerland. Group members restored, refurbished and built numerous churches, often designed as integrated works of art. In 1924, a counterpart, Rot-Blau (red-blue), was formed in German-speaking Switzerland, led by Hans Stocker and Otto Staiger, which is still active today. Cingria had a significant involvement in the cultural life of Switzerland - literary, musical and artistic – bringing an approach of ‘nonconformity and rebellion in an environment marked by the Puritan reserve’ (http://www.sikart.ch/KuenstlerInnen.aspx?id=4000038). He was involved in the creation of ‘Les Cahiers Vaudois’ and participated in journals such as ‘L'Oeuvre’, ‘Nova et Vetera’, ‘Aujourd'hui’ and ‘Ars Sacra’. From the 1920s onwards, Cingria created sets and costumes for popular theatre shows inSwitzerland while in 1936 he founded the Compagnons de Romandie with Jo Baeriswyl with the purpose of promoting masterpieces of Catholic theatre. These artists and other French-speaking ecclesiastics were in touch with and inspired by the writings of Jacques Maritain and the practice of Maurice Denis. It was Maritain who put Cingria in contact with Gino Severini which led to many ecclesiastical commissions in Switzerland for Severini, often together with the St Luke Group. Denis first worked with some of these artists when he was commissioned to work on the renovation of Notre-Dame Geneva and also became artistic director for the construction of Saint-Paul Grange-Canal, also in Geneva. Together they dreamed of ‘creating a movement of rebirth of religious art in France and in all Catholic countries.’ This ambition resulted in 1919 in the formation of the St Luke Group and also of the Ateliers d'Art Sacré by Denis and Georges Desvallieres in Paris. Endowed with a vivid imagination and full of poetic realism, Cingria’s style was similar to folk and naïve art. His painting and stained glass is lyrical, seemingly spontaneous and full of both sensuality and mysticism. The iconography that inspired his work has its roots in the early Christian tradition. At the Vitromusée I discovered that the area has a Stained Glass Art Trail featuring work by Jean Bazaine, Alexandre Cingria and Brian Clarke, among others. On this trail I was able to visit Collegiale Notre-Dame de l'Assomption, the Gothic church in Romont, and Notre-Dame de l'Epine in Berlens to see work by Bazaine. Collegiale Notre-Dame de l'Assomption has so many stained-glass windows it is a veritable museum of stained glass itself. The oldest dates back to the beginning of the 14th century, while others date from the 16th and 19th centuries. Modern windows have been created by Henri Broillet, Sergio de Castro (north side-aisle), Cingria (the Twelve Apostles in the clestory) and Yoki (Chapel of our Lady of Portail). The ancient and contemporary coexist, although the contrast between the works of different styles and eras is striking. Yoki Aebischer Emile, who hailed from Romont, was an innovator of modern geometric and expressive techniques in religious art. Yoki was born in 1922 and, as a child, cycled through the countryside to marvel at the stained glass windows of Cingria in Siviriez. After various jobs, including that of a worker in a glass factory, he became a draughtsman in an architectural office. As a result, in 1938 he met Fernand Dumas, the highly prolific church architect, and through him, Maurice Barraud, Emilio Beretta, Cingria, Severini and other artists of the St Luke Group. In the 1940s, he discovered the art of the Nabis and, after the war, he attended the Academyof French painter André Lhote in Paris. He went on to create more than a thousand windows for churches in England, France, Germany, Israel, Italy and Switzerland,. He was also involved in the repair of war-damaged monuments in Britain, France andGermany. As well as frescoes and stained glass, he produced many paintings, lithographs, mosaics and tapestries. In 1981 he co-founded the Museum of Stained Glass, which is now the Vitromusée (http://www.lagruyere.ch/2012/11/yoki-son-envol-dans-l%E2%80%99or-de-l%E2%80%99automne.html / http://www.lexpress.ch/fr/societe/loisirs-et-culture/l-artiste-peintre-fribourgeois-yoki-est-decede-581-1068076). Also on the trail is the Abbaye cistercienne de la Fille-Dieu which commissioned Brian Clarke in 1996 to create windows for its renovated and reordered chapel. Arriving to see these windows I chanced to arrive for Vespers followed by silent contemplation in the still onset of darkness falling. The flakiness of some of the lead vocals, before then being caught in the wondrous harmonies of unified responses, only added a sense that our individual fallabilities are accepted and swept up together in the great corporate song of heaven. As participation in the service did not facilitate the taking of photographs I enjoyed an overnight stay at the Hotel du Lion D'Or before returning in the morning for a photographic session in the early morning light. Collegiate Church of Our Lady of the Assumption - Rue de l'Eglise, 1680 Romont. Web: http://www.upglane.ch/?paroisse=Romont. Vitromusée Romont - Au Château, Case postale 150, CH-1680 Romont. Web: http://www.vitromusee.ch/en/vitromusee/whats-on.html. The photos show Romont Castle which houses the Vitromusee, windows by Alexandre Cingria and Sergio de Castro, and a tapestry by Yoki.